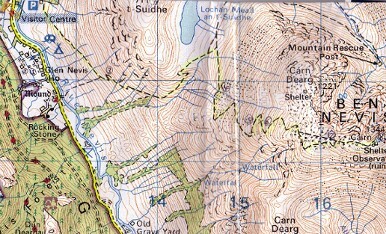 Map showing route up to the summit of Ben Nevis and points from which the following photo's were taken. We set of at 05:30 Friday 3rd June 2005 from Upminster, stopping at 8:15 at Morrisons in Broughbridge for breakfast, and then a small cafe on the banks of Loch Lomond at 15:30 for lunch and arriving at 18:30 in Glen Nevis after a 500+ mile journey. We set up camp in the shadow for Ben Nevis. I made tea and toast, but the miggies got the better of us, so we made our way to the restaurant for some supper, which consisted of Burger, chips and a couple of beers. .
Breakfast. Anyone for cereal followed by egg, bacon, mushrooms, beans, slice of toast and a mug of tea? We look like hardened Professional campers, don't we..
At 10:30 Saturday morning, we set of for the Visitor Centre, the start of the path to the summit of Ben Nevis. We could see this part of the walk from our campsite, even this far seemed a long way to go - but it's not even 1/10 of the way up! To start with the weather was fine with good views and a high cloud base, it looked like all the wet weather and warm cloths weren't required along with the maps, GPS, compass etc. But can you see behind us, the clouds were starting to form right above our heads. This was a steady but ever upward walk along a man-made path. From the base the climb was daunting and every time you turned a corner, the path just keep going up!! You can see the path we used zig zagging up in the distance. Here it comes, cloud and a lot of it. The weather report now changes to showery - on Ben Nevis this mean its going to be WET! Chris E found this hat dicarded next to the path on a Cairn (small pile of rocks) which we used as target practice for a while. The view vanishes, we didn't know what was going to happen next, but from a pleasant walk, the temperature sudden drops and out comes the walm jackets and weather proofs. Driving rain and very slippery snow - not a good combination, we slipped and slidded over this part of the climb. I never thought I'd say this but for the first time I really needed a pair of those walking poles. This was the hardest part of the climb, what we didn't realise was that there is another path that went around this patch of snow! At the summit, just before we arrived people coming down saying that the views were great, but we couldn't see further than our hand. It continued to rain all the way down, only stopping half hour before we cralwed into the local cafe for a cup of tomato soup and a mug of coffee. The two Chris's had to go to the restaurant alone that night, as I had slipped into my sleeping bag to walm up and my legs refused to get out!! 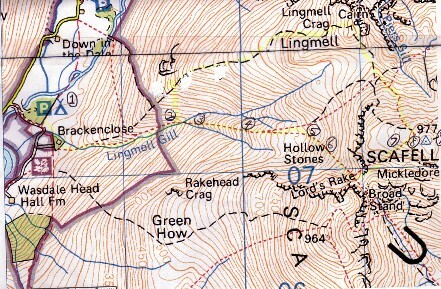 Map showing route up to Scafell Pike summit and points from which the following photo's were taken. Sunday morning, after breakfast, we packed up and drove into Fort William, so Chris E could buy some new climbing boots, his others had been torn to threads desending Ben Nevis. Then the long drive to the Western Lake district ( thanks SatNav for sending me the wrong/long way round). On the way it started to rain again, and at times I nearly abandoned the second climb and returned straight home. When we arrived at Wasdale head, it was still drizzling, but the National Trust guys stated a high pressure front was coming our way and the weather was going to inprove, so we booked two nights and headed for the pub at Nether Wasdale (the local had just suffered from smoke damage and was closed) The weather did improve, as this photo taken the next day, shows..
With my legs still aching, it took a few minutes before I was into my stride but even walking up the rivers and jumping on the large boulders like spiderman, Chris W was way ahead of me. This was more of a climb, the paths were not so defined and we had to refer to the map to keep track of our position. We used the GPS to keep a track on our elevation, sometimes we walked for ages without much gain. Here we are about half way up, we dicided to take a harder route up and the 'easy' way down. Chris W went ahead and found a small ledge to follow up, we followed the marked route. Resting at Hollow Stones. Chris and Chris wait for me to catch up again, but as soon as I do they are off again. It must be said without their encouragement I would never have made it to either summit. At Lords Rake. On the right is Brown Tongue. The path we followed is on the bottom right - not so many people were climbing Scafell as on Ben Nevis. Chris E still wearing the hat. Views from all sides of the lake district - but unable to locate 'The Old Man of Coniston'. Great views from the summit. Only the second summit with views (i.e. not in cloud), both in the Lake District, the other being The Old Man Of Coniston. Now just to get down. We changed our mind and headed to a steep and slippery path down, then had to cross some smaller peaks to get back to the tent, a quick brush-up then of to the pub to celebrate having climbed both summits in three days, not bad for an old one ah.